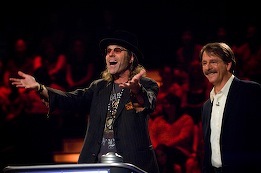 Singing Bee host Melissa Peterman and country singer Big Kenny with host Jeff Foxworthy on Are You Smarter Than a 5th Grader? CMT has a new jones for game shows. The country cable network has ordered 20 new episodes of The Singing Bee, which failed on NBC with host Joey Fatone but is considered a hit on CMT with new emcee Melissa Peterman, formerly of Reba. The Aug. 15th finale of Singing Bee drew 848,000 viewers nationally, which is pretty big stuff for CMT. So a second season of the show is coming in January. CMT also has exclusive cable rights to the syndicated version of Are You Smarter Than a 5th Grader?, which originated on Fox but currently isn't included in the network's future plans. As part of the deal, CMT will co-produce new themed episodes of the series, beginning with a week's worth of country music stars playing for charity on Sept. 21-25. Host Jeff Foxworthy, who also presided over the Fox version, will be testing the rudimentary brain power of Big Kenny, Heidi Newfield, Bucky Covington, Jack Ingram and Emily West.